The history of the Club goes back to 1904 when the Derby Automobile Club was first registered with the Automobile Club of Great Britain thus embarking on the promotion of Motor Sport through the decades, including running Donington Park prior to the Second World War. They continued after the War having changed their name to The Derby and District Motor Club until the 3rd April 1949 when they requested to amalgamate with a local Motorcycle Club. That Motorcycle Club came into being following meetings of a group of motorcyclists during December 1931. On 3rd January 1932 four Officers were elected: Captain, Vice Captain, Secretary and Assistant Secretary. At the meeting on the 15th, the Captain requested all Members to be Courteous to all other road users!! By the 24th a List of Club Rules were discussed and a President Proposed. Formally on the 29th January 1932 a meeting named the club, “Pathfinders’ Motor-Cycle Club” and Listed the Rules. The Pathfinders’ Motor-Cycle Club organised Trials and Scrambles from 1932 at venues such as: Coxbench, Hunger Hill, Litton Slack, Washgates, Cheeks etc all to become legendary sections in the Bemrose Trophy Trial. After the War the Club undertook the running of Mountain Grass Track Races at Wingfield Park and attendance estimates for the first meeting on Easter Monday, 22nd April 1946 varied between 30,000 and 40,000 spectators!! The consequence of this financial undertaking and the possibility of claims against the club was that the club became a “Limited Company by Guarantee and not having a Share Capital” which is still the case today. This makes all members, in the event of a winding up petition, liable up to a maximum of £1 each. 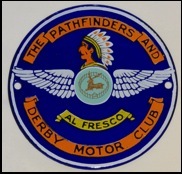 Following the request for amalgamation from The Derby and District Motor Club, a series of meetings were held, 27 variations of a new club name were tabled and finally on the 31st May 1949, “The Pathfinders and Derby Motor Club, Limited” was agreed. With the club deciding to curtail racing at Wingfield Park, it continued to run many trials and scrambles then return to Grass Track Racing at Osmaston Manor (Polo Ground), near Ashbourne. The clubs professional attitude enabled them to convince Lieutenant-Colonel Sir Ian Peter Andrew Monro Walker to allow Road Racing at Osmaston Manor with the first meeting on 28th July 1951. Scrambling in the 50’s had continued to rise in popularity and the club became aware that Holt’s Wood in Dobbin Horse Lane, Clifton was available for purchase and successful negotiations were completed on the 11th August 1959. With the success of the Television and International Scrambles in the 60’s and 70’s, Clifton Scramble Course was known throughout the UK. As well as still running numerous trials, the club returned to also organising Road Racing and essentially ran Donington Park Road Races up to World Cup standard from May 1978 until 1995. Since then trials have been the club’s main events including the ground breaking Kickstart Events at Donington Park and Easton Neston near Silverstone. Clifton Trials Land remains owned by the club and all of its trials are run there.